.⑇’ˆ`⋱⋰´˜’××’ˆ`⋱⋰´˜’’∙. The Sixth Cohort .⑇’ˆ`⋱⋰´˜’××’ˆ`⋱⋰´˜’’∙. .⑇’ˆ`⋱⋰´˜’× "No way. No how!" ×’ˆ`⋱⋰´˜’’∙. .⑇’ˆ`⋱⋰´˜’× Recruitment is Open ×’ˆ`⋱⋰´˜’’∙. .⑇’ˆ`⋱⋰´˜’× Who We are ×’ˆ`⋱⋰´˜’’∙. The Sixth Cohort belongs to the Blood Legion. The sixth is a highly disciplined Charr force that answers first to their own, and then to their legion. The soldiers in this Cohort have already left their mark on this world, and intend to keep doing so. Uniformed in legion armour, symbolising loyalty to their legion as well as each other, they march at the front lines of any battle, first to enter, and always last to leave. These soldiers have marched from the fiery wastes of Flame Legion lands, to the cold, hard, crystal bite of the Brand, and still they march. They believe strongly in absolute discipline, a testament to the true Charr soldier. Strength and honour above all else, marching in step, in uniform, and answering any order with a thundering "Yes sir!". But the face they show the enemy and their comrades of cold hard discipline, is just that, a face. Most important in this cohort, is brotherhood. They can swap as easily from shields high, sword in hand soldiers, to laughing, drinking friends, recalling the latest story around the table while poking fun at their fellow Warbands. Eager to have a laugh, either by throwing someone in a river or starting a friendly brawl, they always look out for each other. You can't start a fight with one Sixth soldier, without finding the rest of them drawing blades and loading rifles. The Sixth Cohort is respected for it's efforts against the Ascalonian ghosts, Flame Legion And Separatists. It has had it's hand in defending Ebonhawke against Renegades, and there are rumours that some of it's soldiers were even responsible for defeating a summoned Titan when the Sixth and Ninth cohorts pushed the Flame Legion back and retook their Flame Citadel. The Cohort has taken many casualties, and so has seen many new faces join, some serving for many years, some falling under the blade of a Renegade or the undying fury of a ghostly spell. Fewer still can call themselves veterans. For this the Sixth holds some of the most battle hardened soldiers stationed in Iron territory, and we will make sure Blood Legion doesn't go unrecognised. All members are expected to act like soldiers. The Sixth pride themselves in their discipline and brotherhood. Joining the Sixth is more than just joining a military. It's joining a family. You'll be expected to stand up for your bandmates, they'll protect you, and in turn, you'll protect them. Soldiers are paid on a salary. This does not include bonuses for particularly exemplary behavior or actions. Leave can be requested, and a soldier is free to travel anywhere they like in their free time so long as they are present when their Warband mobilises for a mission. It is relatively easy to join one of the warbands. But it is much harder to stay. Members are inducted after a fight to prove they have what it takes to hold their own. After taking a short oath, soldiers are then trained to fill in the gaps missing from their Fahrar training. soldiers are trained to fight, how to dress, how to hold the line, how to act, and how to march. If soldiers fail to grasp these concepts of basic soldiering, they are often dismissed from service, to return to life as a Gladium. Discipline can and will be enforced on soldiers that disobey the orders of an officer, their Warbands ideals, or their race.This could involve anything from cut pay, polishing tanks or cleaning barracks, to lashings or dismissal. Above all. No matter how strict, your brothers and sisters will always try and help you, maybe a quiet word, perhaps helping with a personal problem, or dealing with an aggressive adversary. In the right situation, your officers will always turn a blind eye. You're all family in the end. .⑇’ˆ`⋱⋰´˜’× Joining the Ranks ×’ˆ`⋱⋰´˜’’∙. Those interested in joining the Sixth Cohort will need to make a character that is suited for the role, that is, a typical soldiering Charr, fierce, disciplined and loyal. If you already have a character that you'd like to join the Sixth, you'll need to speak to one of us to help your character develop into their new role. "The three virtues of the Charr are industry, discipline, fearlessness. The three weaknesses are aggression, bloodthirst, and ruthlessness." Any new recruits will never simply "join". We will always work out a RP where your character will happen across us, or we will come across you, anything from meeting you in a bar, a prisoner in a Separatist camp, to finding you wounded out on the field around your dying comrades, to help give your character a solid, developed reason to want to join our ranks. In order to join our ranks, you simply need to get into contact with Ran Shatterclaw. You can do this in game via (Ran Longclaw.8031) or by messaging this profile using the Enjin mail system. Otherwise, we can be found usually in the Heroes Canton un-instanced and welcome IC approaches! In order to sort out your uniform, contact an officer in game who will help you through the process! We take great pride in our accuracy, that means Blood will look like Blood, Iron like Iron, and Ash like Ash. The Legions don't have uniform and Legion colours for the sake of it! Our uniform and weapons are always Charr cultural in theme. Uniform isn't just to show your allegiance. Uniform is a show of unity, loyalty and discipline. A large mass of celtic warriors, however impressive up close, screaming and waving their weapon, pales in comparison to silent, uniform ranks, marching towards you in complete silence. Uniform is a big part of your Warband, as it accurately depicts a military RP, we have selected the best components that the game has to offer for the Charr that gives everyone a good set of equipment that has been worked out to make sure your character is a ruthless killing machine, and with a warband standing at your back, nothing will stand in your way. Any questions about collaborative RP, please message Ran via Enjin mail or in game! On a more serious note: 'Your Role', second paragraph, first sentence; it should be paid, not payed. EU - Kyra, Ferra, Kalani ("Kai"), Sera, Mira, Dala, Kaela the Swift, Sevara Steelguard, Rinn Stormrazor, Almira Fleshmender. Also reachable on Skype, Steam, etc. under this username. Sunny! With a chance of mischief! This guild looks truly fierce. I can't say I've dabbled in Charr RP, but if I get an open window, I think this guild has given me the push I need to reconsider remaking my Engineer! Really nice to see a change from the usual mercenary feel that seems to dominate at the moment, not that I think mercenary guilds are any lesser, but certainly a bit of diversity is a wonderful thing. Best of luck with this guys. Best of luck with this guys. No need for luck now (I hope!) Been active for nearly six months now, and still growing! Recently introduced warband chapters which are a chance for our members to tie in some of their backstories, got our first one tomorrow. On Saturday, Claw Warband was called to reinforce a beleaguered Iron Legion detachment, falling under friendly fire no thanks to the darkness of the night, Claw Warband was shocked to find a Vigil Patrol, belonging to none other than the Ashen Chapter. Falling under fire from a Separatist ambush, with the Ashen Chapters support, Claw Warband managed to drive back the Humans, only to find themselves attack from an Ogre force. 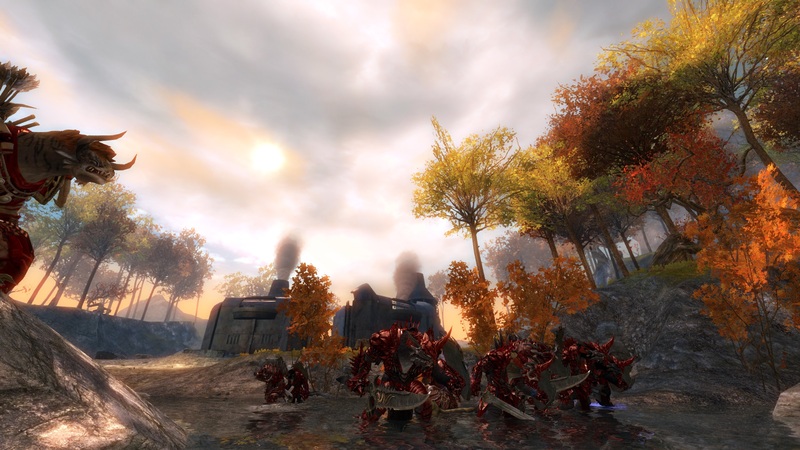 Separatists joining forces with Charr and Vigil, managed to drive them back, coming to a decisive victory when the Ogre Chieftain was slain at the hands of two Claw soldiers. Great fun role playing with The Ashen Chapter [TACH]. 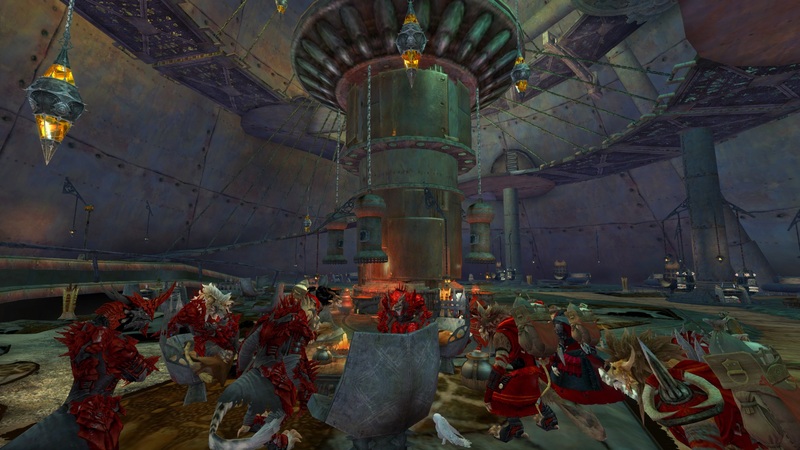 Tonight, Claw warband was tasked with slowing down the advancing Ogre threat from the east. After two warbands of Scrappers were ambushed and cut down by Ogre's, this Kraal had unfortunately selected itself as an example to the other Ogre's who were slowly advancing closer to Black Citadel lands. Gathering the warband together, a plan of attack was drawn up. Setting out, it was executed with brutal efficiency, a small team challenged the Chieftain's main elite guard, while the remainder of the warband breached the back of the Kraal, storming in as their Chieftain was killed, spreading chaos and disorder, resulting in a rout of the Ogres inside. Among the chaos two soldiers were wounded, before the Ogres were ultimately put down, and the Kraal torched, before the red armoured soldiers marched back out. Leaving behind mess of black charred timber and burnt corpses, serving as a reminder to neighboring Kraals.